Raptivity for many years has done a fantastic job of providing a means of creating interesting, fun and educational interactions that anyone can create. The interactions are stand-alone pieces that can be embedded into web based training, mobile learning, an instructor led course or as a part of a web site. This is really a different “modus operandi” than many vendors in the online learning industry. But you know – it works. Most of us have one or two core rapid development tools that we use for our work. The drawback to those tools is often the interactivity – or lack thereof – that comes pre-packaged. What if we had a tool that would “package” or “link” together the interactions we’ve built with Raptivity? Say for instance, you created the following interactions with Raptivity for a course you are working on: Flash Card, Adaptive Question, FAQ,Pyramid, Advanced Hub and Spokes, and a Multiple-Page Assessment. Open up a new tool in Raptivity called the Raptivity Linker and drag each of these interactions into it. You would be able to move the sequence of these interactions around simply by dragging and dropping a thumbnail image of those interactions into the appropriate place. Simple. Publish and you have yourself a nifty course of instruction created completely of high quality Raptivity interactions. Neat-oh! Ah but you want more. I know you do. You can say it. But Greg, what I really want is…. How about if you could select the type of navigation the wrapper takes upon the completion of an interaction placed into the Raptivity Linker? Cool. You can do that. You can have a Next button, a Back button or a button that opens up a Table of Contents, each of which takes you to another interaction. “I want to create my own look and feel for the wrapper”, you say? You can certainly choose a color scheme or background image for your wrapper. You can move the location and appearance of the navigation buttons. You can even add images to the table of contents. Speaking of the table of contents I know many of you desire numbers in your tables of contents – and the rest of you don’t. You both get your way. Just make your choice. Raptivity is going about this to simply be able to “link” your interactions together into a “short” course. This is not the same as building out full web based course.One way to look at this as a great way to create numerous branches within a scenario based course. Go ahead, use your base tool but use the Raptivity Linker to link together your interactions for each branch of the scenario. Add those into your course as needed. You get the best of both worlds. Your base tool handles the course navigation, the introductory and conclusion text for the course, each objective and scenario while the various Raptivity Linker “short courses” provide the interactions for the rest. Cool! Mobile delivery? Of course! This is perfect for mobile delivery. Many Raptivity Interactions output to HTML5. Linking a series of these together and adding a short assessment is perfect. Just don’t get too lengthy with these. Remember, mobile learning needs to be short – less than five minutes or so tops on a smart phone and really no longer than 15 minutes or so on a tablet type device. I am a big Lectora fan so, let’s use Lectora to set up what it does best – SCORM packing, full navigation, base shell, and the setup for all textual content. I want Lectora to keep track of my course and user variables and work with the LMS to do bookmarking and other administrative work. Because I don’t want a boring page turner course,I’ll use Raptivity for the interactions. No big deal so far you say. This is what we already do. Here is the difference. Let Lectora provide the navigation only to the launching point of the scenario. Then use Raptivity Linker to link together the scenario itself. Not just one interaction. Pre Raptivity Linker, you could embed only one Raptivity interaction on any one Lectora page. Now, you can now insert an entire highly interactive scenario onto one Lectora page. For example, create your Raptivity Linker interactive scenario by linking a “3D Cube”, a “Role-based Individualized Simulation”, followed with a “Branching Question – Explorative Type” assessment. You can do this multiple times in the course which truly adds to the overall course. Another example is even simpler. We all know that mobile learning is not simply making WBT content available on mobile devices. See my blog series on eLearning Industry’s web site (http://elearningindustry.com/moving-to-mobile-what-are-the-gotchas). We want small snippets of information for mobile devices. Use Raptivity Linker to link together a short series of Raptivity interactions such as “Panning Cards”, “Memorize and Recall”, and a “Multi-Page Assessment” output as HTML5 for mobile delivery. Short, sweet, and to the point. 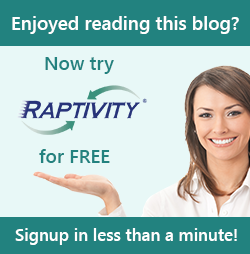 Raptivity Linker gives you that option now. A great way to present content on mobile devices without forcing the user to open multiple different learning packages. Moving forward I suppose it would not be a great leap to create a full blown rapid development tool to compete against the likes of Lectora and Articulate Storyline. I’d vote against that. I think Raptivity’s greatest advantage to those of us in the online learning community is in creating highly interactive interactions that people actually want to use. The type of packaging I’ve described in the Raptivity Linker is as far as I would like to see them go down this road. I don’t want to see energies spent on re-creating what other vendors have already done. Other vendors don’t do the interactivities well. Raptivity does and that is what I need. When I first started using Raptivity I’ll admit I wanted to know what to do with the interaction. I did not understand that I was only building interactions. This works great if all I need is one or two interactions put into a course that is being built to add to it. But let’s face it, there are so many fantastic interactions in Raptivity now that we really have a great opportunity to link several of these together into short “snippets” or “experiences” of interactions. These can be used as stand-alone items or be embedded as “learning experiences” within a larger course.